I am a huge Cake Batter fan. I am also a huge Strawberries and Cream fan. 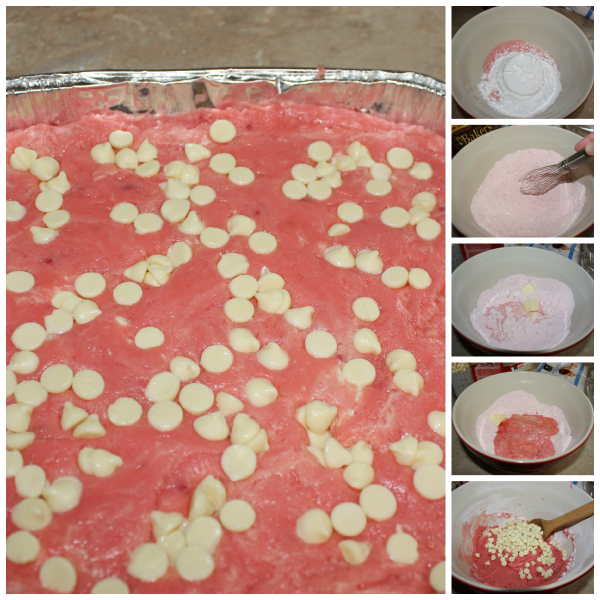 Mix the two together to create this Cake Batter Strawberries And Cream Fudge! This is a delicious sweet treat everyone will love. 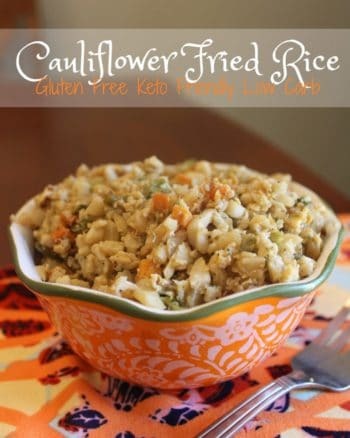 Tons of yummy flavor and super easy to make! With Valentine's Day coming up I thought these Cake Batter Strawberries and Cream Fudge would be a perfect fit. These delicious squares of yumminess would also be perfect for a birthday party, a baby shower, or even just as an evening treat for mommy after the kids are tucked away in bed. We totally deserve it!! Here's a picture of the ingredients you will need. The recipe is below. Enjoy them! 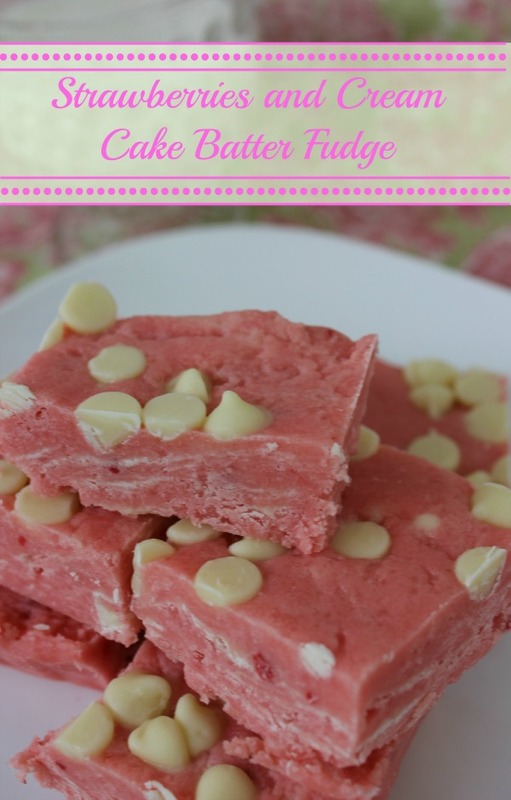 Using the dry strawberry cake mix to make this yummy cake batter fudge recipe is a great option. I prefer using white chocolate morsels, but you can use the mini version or none at all. Whatever you choose it will be amazing. It will only take a few minutes to mix this all up to create this delicious Cake Batter Strawberries & Cream Fudge Recipe. 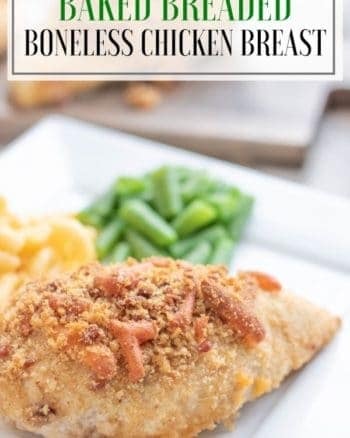 Slice it into bite sized pieces, and bag it up to give as a special treat to your friends, or just use it as a great after school treat for your little ones. Make sure to print the recipe and store it away somewhere for future use. Make Valentines special with these Strawberries and Cream Cake Batter Fudge. These are actually great any time!
) Grab yourself an 8x8 or 9x9 cake pan and spray it generously with non-stick cooking spray and set aside.
) 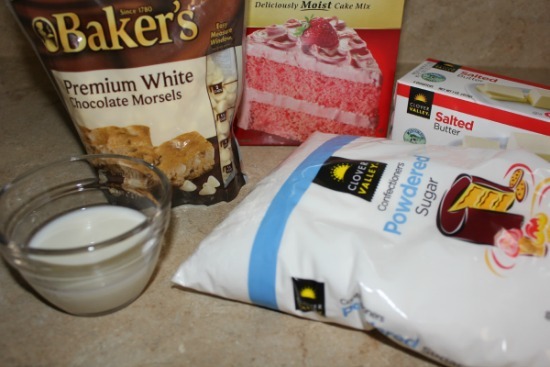 In a large bowl, mix together cake mix and powdered sugar with a wire whisk. Cut your butter into 4 individual pieces and drop into the center of your powdered mixture. Pour your milk into the center and DO NOT MIX!!!
) Place UNMIXED ingredients in the microwave and cook on full power for 2 minutes. Remove immediately and carefully mix together. Once everything is mixed fold in 2/3 cup white chocolate chips.
) Spoon your mixture into the cake pan and spread evenly. Pour remaining white chocolate chips over the top and gently press down into your fudge. Place in the refrigerator for at least 2 hours. Enjoy! 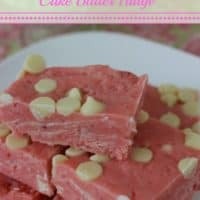 You can also make sure to pin this Cake Batter Strawberries and Cream Fudge recipe to Pinterest so it will always be handy, or even bookmark this page to come back to later. 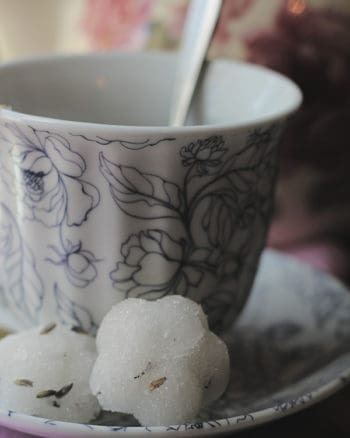 If you are looking for more great recipes or Valentine's themed ideas – look no further than our other blog post ideas below! We have tons of great ideas to help you and your family enjoy and celebrate the upcoming Valentine Day holiday!